Late entries, bib pick-up and event enquiries can be made from 6.00am on event day at the marshaling tent across from Garden Park (on the water tower side of Island Road). Toilets are located in Apex Park, at the Gateway Visitor Centre in Garden Park and next to the Memorial Hall in King Edward Street. The Cohuna Clay Target Club will make their toilets available, adjacent to the start line of the running events and junior bike event, at Dalton’s Bridge. On course, toilets are located at the ski run on Island Road, and portaloos will be made available at the 5km and 9.5km points of the 12.5km trail run and the 11.5km and 18.5km points of the half marathon course. We discourage the use of off-road toileting in the bush for obvious reasons. Please be respectful of our area; plus you don’t want to be caught with your pants down! While you’re waiting for your family and friends to finish their events, and once they are back, enjoy the atmosphere of our event village, located in Garden Park. There will be coffee, hot food, music and stalls to keep you busy. 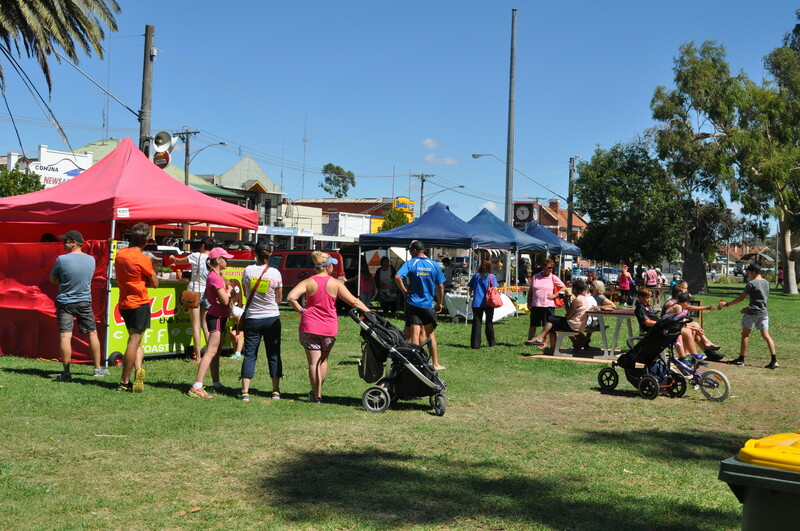 The Cohuna Farmers & Makers Market will be operating from 8am to 12pm. There’ll be fresh food and produce, sweet treats, plants, quality craft and more. The Bunyips sporting group will again be serving their delicious cooked breakfasts throughout the morning – perfect if you’ve been travelling in the car for hours! Cohuna ROCKS: Keep the kids entertained by searching for Cohuna Rocks in the surrounding park areas – Apex Park, Garden Park and Gilrule Park (across the weir).